Have you ever wondered just how many gliders really SM? Or what percentage undergo amputations each year? Or maybe you wondered how often the average owner experiences an emergency surgery (just how prepared do you need to be anyway?). When talking to your vet, have you ever wished you could say, "well _________ is actually more common than we think?" Or "100's of gliders survive this procedure each year." ???? 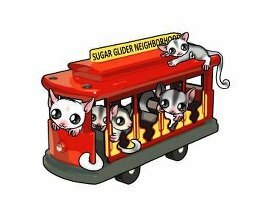 Do you ever wonder what the most common ailment is for sugar gliders? Or if our educational efforts are making a difference in the health of our gliders? Well, these questions and more are some that the SUGAR group seeks to answer with our yearly incidence and census survey. The 2012 Incidence and Census survey only takes a few moments to complete, but provides us with a great deal of valuable information for our research. This survey should be completed once every year by every owner. So, even if you completed it last year, please do so again for the current survey year. If you are planning to attend the RRRoundup, you may wait until you get to the RRRoundup to complete the survey.